Our congregation was started . . . In 1954 with twelve members meeting in a room at the old Fire Hall. 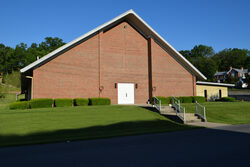 We were granted congregational status in 1957 with 41 members. That same year we purchased property on Winchester Avenue, with a large house which was used as both the parsonage and sanctuary. We built a sanctuary onto the original house in 1958 to accommodate our growing membership. In 1975, we purchased the property known as the Old Moorefield Grade School from the Hardy County Board of Education and six years later, February 1981, we moved into the present facility.